The Get Fresh Crew: J. Crew for Kiddos. Once upon a time I wouldn’t be caught dead in anything J. Crew. Navy roll neck sweaters? Eh. Boxy white mock turtle necks? Meh. Chino khakis? Yawn. Now don’t get me wrong. I totally owned a copy of “The Official Preppy Handbook” back in the 80’s and yes I went to my friend Suzanne Chardoul’s “Preppy” party in 8th grade and made everyone call me Muffy (I’m not joking). But J. Crew wasn’t even peppy preppy. It was basics preppy. And sadly basics=boring. And then something happened. Something wonderful. The skies parted, the sun came out and the Land of J. Crew was transformed into a glorious preppy-chic land of rainbow goodness! Jeweled sandals! Brilliant colored cardigans! Funky accessories! Modern silhouettes! Suddenly, J Crew was FUN. A lot of this transformation credit goes to Creative Director Jenna Lyons, who worked herself up the ranks and turned J Crew into a mega successful operation. One of her ventures was to take the same stylish sensibility she brought to her women’s wear and bring it to the land of kiddos. Crew Cuts launched in 2005 and I have to say it’s pretty fab. It’s like they took a little gamma ray gun and shrunk everything down to peewee size. 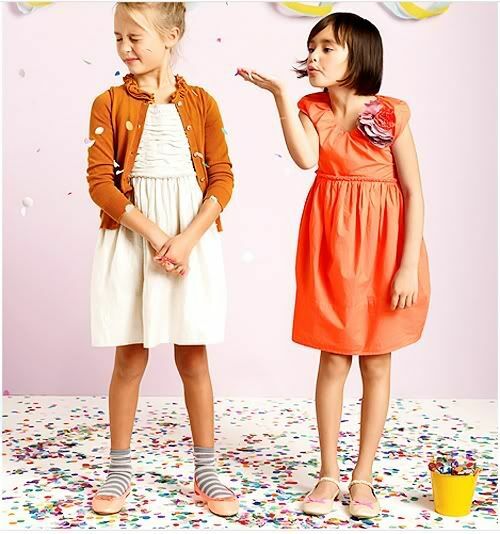 The clothing is kiddo-friendly, has lots of fun details and pops of vibrant colors. Just take a look at these two cuties! Check out those hot pink tights on the little girl and I LOVE the bright orange colored laces in his little desert boots. Genius! Crew Cuts is available online and in select J Crew stores. They are currently offering free shipping on all Crew Cuts orders—and don’t forget to check out the sale items. 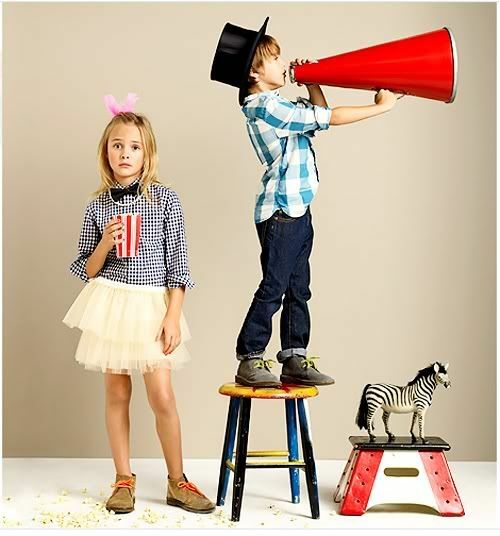 Modern Kiddo Style Tip! Mix and match yer brands! Tempted to splurge on a cute top or jacket? 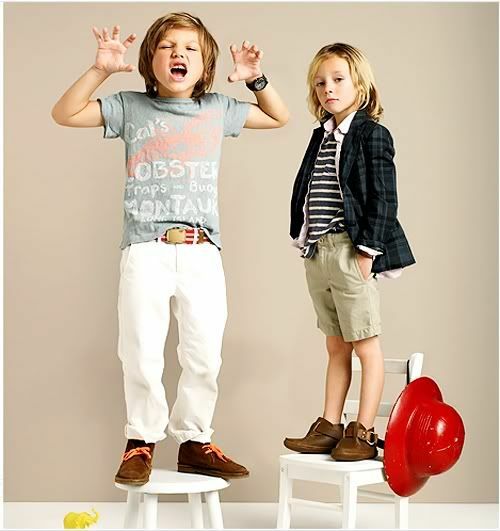 (or those amazing boy’s desert boots I’m dying over?!) Go for it, but then complete the look with an affordable pair of jeans or shirt from a more budget minded retailer like Old Navy or Target. No one will ever be the wiser…. See! I’m not crazy- I have sooo much Crewcuts for Stella. -I think I will go completely in the red though if I have a boy someday. Their boy stuff is just ingenious. I agree, Marla! Crew Cuts boy stuff is off the chain cute! And very clever to mix and match, Miss Alix! Very clever indeed! I agree with you…we have Jenna Lyons to thank for their new “look”. It was getting so stale, now it’s actually CUTE! HAHA – I was at that party, muffy!